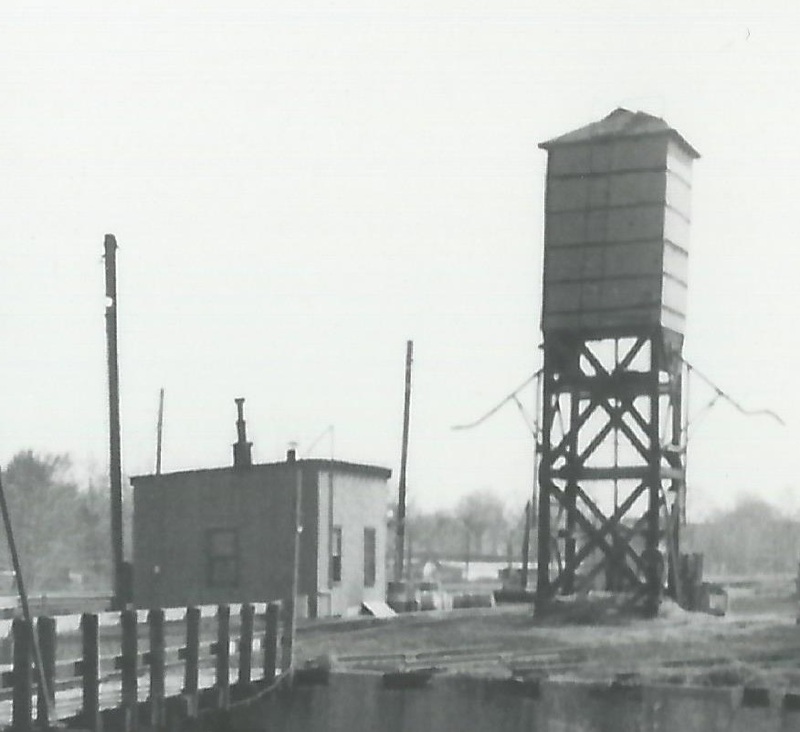 The sand storage bin and dryer house at Danbury no longer exist and few pictures could be found of these two structures. The photo that reveals the most usable information for modeling purpose is the below photo taken by Peter McLachlan circa late 1950's. This photo supplies the best information on the construction and sizing the heigth of the sand bin and the east end of the dryer house. Without this photo building a creditable model of these two structures would have been unlikely. 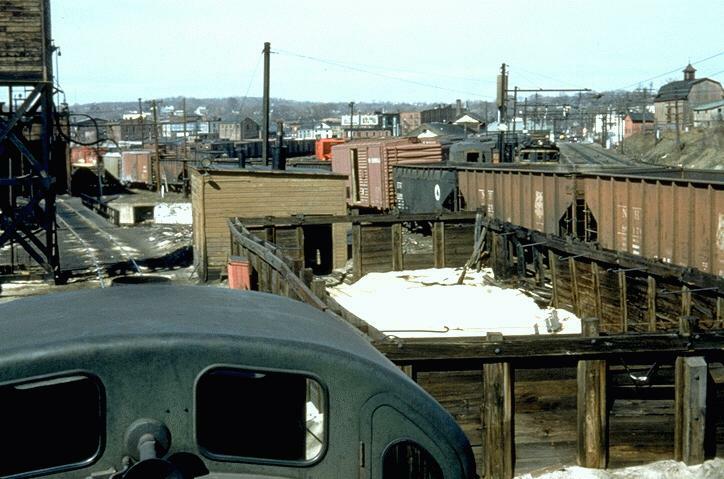 The length and width of the sand bin and dryer house was best determined by a vintage aerial photo sizing the structures comparing them with boxcars and passenger cars of the era that were present in the yard when the photo was taken. 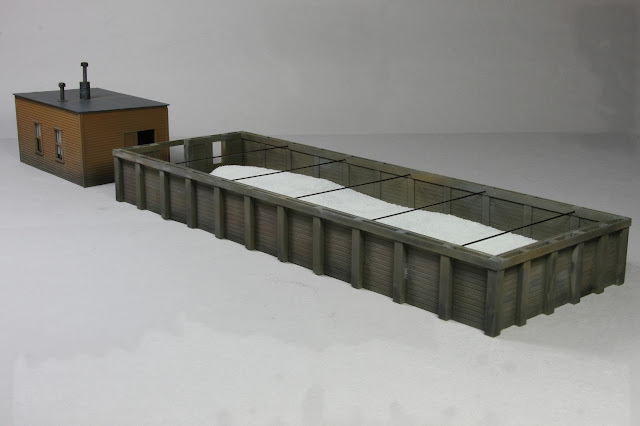 The model length would be prototypical but the scale distance between the tracks on either side of the sand bin is somewhat narrower on the layout than on the prototype seen above, the model width would have to be adjusted to fit between the tracks on the layout. 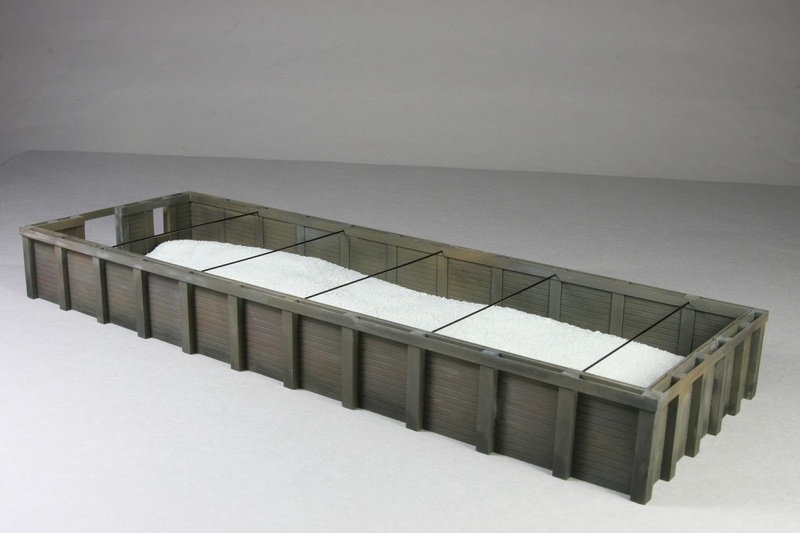 The sand bin model is made from styrene strips and sheets. The sides are made from sheet V Groove siding and the vertical support posts are dimensional strips. Below are the 4 sides and baseplate on the flat before assembly. I believe during the era of the layout the New Haven was getting its locomotive sand from quarries along the railroad on the lower cape near Provincetown MA. Below is the painted model filled with a light almost white sand as per prototype photo. The sand dryer house was still standing in the photo below that I took late 1970's, but the sand storage bin has been removed. Combining this photo and the Peter McLachlan photo there was enough to build a creditable model of the dryer house. The model is again a simple styrene building. The sides are sheet styrene clapboard with Tichy windows and a scratch built sliding door. Below are the pieces on the flat. 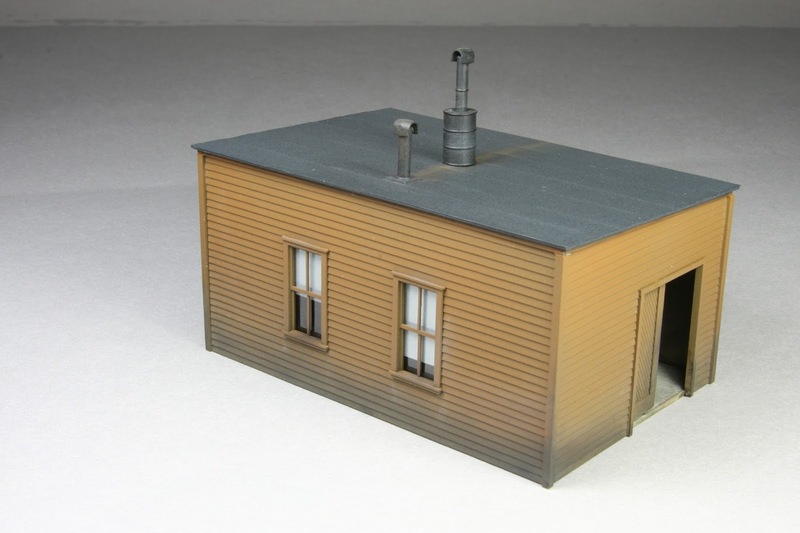 The assembled and painted dryer house. I could not quite figure out the taller of the two smoke jacks, in the prototype photo it looks like an enterprising yard employee used a 55 gallon drum to support the pipe so the same was done to the model until someone proves that is incorrect! Below are the two structures together, they will take their places along with the wood sanding tower on the layout soon.